This review brings you the two products from the range that I have tried and tested, Selexir Peace Bath and Selexir Peace Balm. Both of these products are Free of parabens, artificial colourings and fragrances, no Paraffin, Silicone or petroleum. 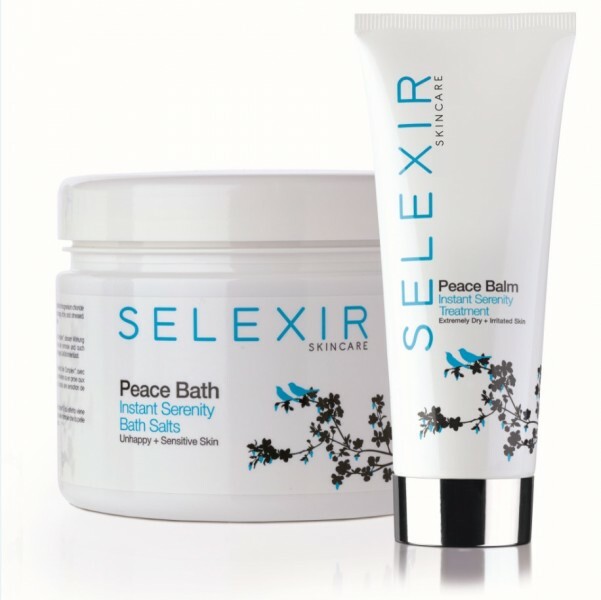 Let's start with the Peace Bath, they are described as instant serenity bath salts for unhappy + sensitive skin. I don't think I have unhappy skin although it can be a little on the dry side, I am a huge lover of Epsom salt baths so tested this as an alternative, 2 scoops from the scoop provided into running warm water, 15-20 minute soak, I used a face mask while I was relaxing, and it was a lovely experience and I have to say left my skin a whole heap softer and more conditioned than an Epsom Salt bath. This could be due to the fact that this Company have a superb reputation for providing products that work with serious skin conditions, if you know anyone that suffers I really recommend spending some time on the website, you could discover something to really help a friend out. Next up is the Peace Balm, described as Instant serenity treatment for Extremely dry + Irritated skin, this little gem I would keep in the house permanently , I do suffer with ridiculously dry hands, my own fault as I am a bleach fanatic, and no I don't wear gloves, ( shame on me ) I like to get down and dirty with my housework. This Balm is a life saver, please note it is not designed specifically as a hand cream, but I get actual cracks from dryness and this really was the solution, be warned it takes some applying, it is a very rich thick ointment type balm that sinks in quickly and really does heal. This could be used on any areas of severe dryness, including the face, ( eyes ) again this is a specific product that really could be a life saver for someone with skin conditions. Seriously worth a look if you want no nonsense skin care that soothes and heals. Yummy. These products sound perfect for my Southern California parched skin. Thank you for sharing this info!